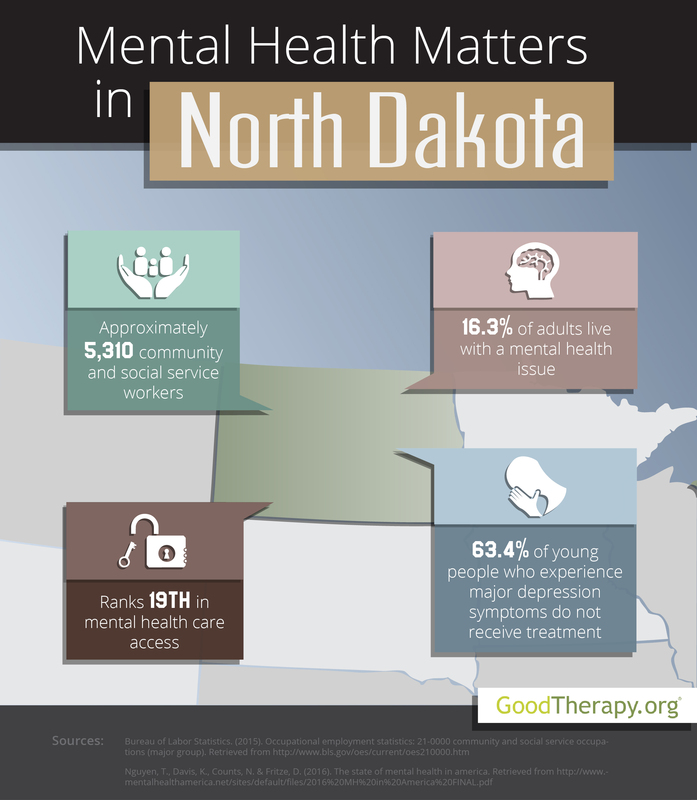 Find a therapist in North Dakota with GoodTherapy.org. Approximately 756,927 people lived in the state of North Dakota in 2015. It is also estimated that 88.6% of the residents are white, 2.4% are black, 5.5% are American Indian and Alaskan Native, and 1.4% are Asian. Females account for 48.6% of all residents. From 2010-2014, the median household income in North Dakota was $55,579. Approximately 5,310 residents work in jobs that specialize in social service, health care, and community welfare. Occupations within this sector may include working at depression treatment centers, clinical social workers, public health employees, counselors at treatment facilities, or marriage and family therapists. In North Dakota, these and other related professions earn an average yearly salary of $45,740. Each year, the mental health standards of all states and the District of Columbia are compared and ranked by Mental Health America (MHA). In the 2016 survey, North Dakota was given an overall mental health rank of 7th, which shows a combination of low instances of mental health conditions and relatively easy access to care. MHA survey authors contend that this ranking was influenced by several factors within the state, including low rates of homelessness, poverty, and child maltreatment, as well as high rates of high school graduation. The state placed 19th in adult ranking, 6th in youth ranking, 6th in prevalence of mental health issues, and 19th in access to mental health services. According to the 2016 MHA survey, North Dakota has the second-lowest percentage of adult residents with adverse mental health conditions. There is also a low prevalence of depression symptoms among younger residents, with 7.9% of adolescents experiencing episodes of major depression in the last 12 months and 3.8% of adolescents currently affected by severe symptoms of depression. The state was ranked 2nd and 1st in these mental health categories. Despite these high rankings, there are some areas of concern for therapists in North Dakota. Data from the Substance Abuse and Mental Health Services Administration (SAMHSA) and Mental Health America suggest substance dependence is a significant issue for both adults and younger residents in the state. A 2014 SAMHSA report on behavioral health in North Dakota claims in 2012-2013, the percentage of heavy alcohol use among adults was higher than that of the nation as a whole. Additionally, cigarette use and binge alcohol use among younger residents were higher than the national average. In the 2016 MHA survey, North Dakota was ranked 48th for adult dependence and 33rd for adolescent dependence on illicit drugs or alcohol.